A powerhouse in Asia, the Japanese National Football Team will once again compete in the World Cup, where they have become a staple, this time in South Africa 2010. We're quite proud to show the shirt the team will defend next summer in the world's biggest sporting competition. 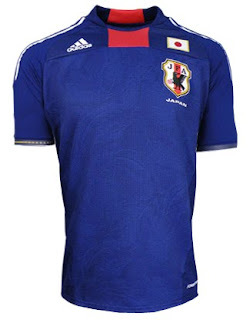 Official Japan National Team 09/11 Home Soccer Jersey. The new stylish royal jersey features some unique style touches, like the modernized collar and sublimated graphic on the front; it also includes the usual embroidered Japan team badge over your heart and adidas logo on the right shoulder. For performance, this ForMotion shirt has anatomically-placed mesh throughout for cool comfort whether you're cheering or playing, and it's made with adidas ClimaCool® - advanced material engineered to reduce heat and moisture build-up, allowing increased comfort.